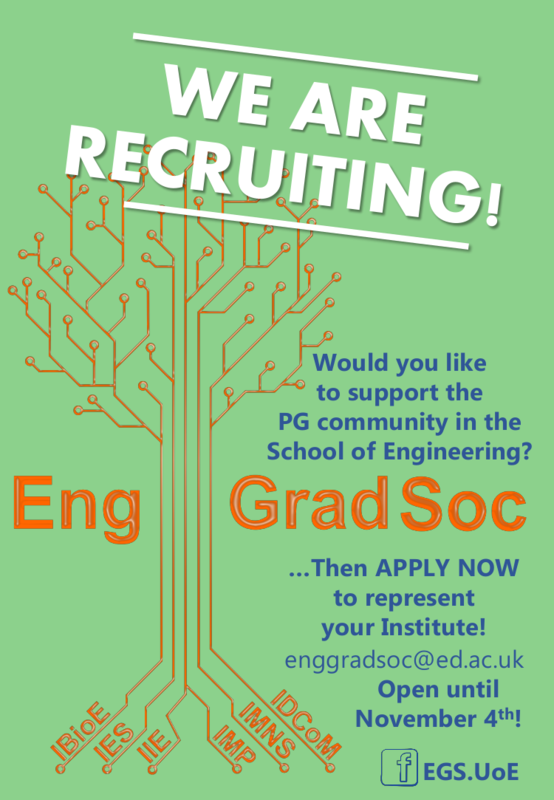 » EngGradSoc: "We are recruiting"
The Engineering Graduate Society consists of seven members, one representative for each institute and the president. We initiated the society almost exactly one year ago aiming to enhance postgraduate students’ research experience here at the School of Engineering. Although we have many more events piled up, the tenure of the EngGradSoc committee is supposed to last for only one year. Therefore, we are looking for PhD students (ideally 1st year, but 2nd and 3rd year students are also welcome) to replace our current committee. We accept applications from now until Friday 4th November. During this year we have organised various activities, such as monthly Coffee Breaks, Pub Nights and Game Nights. Furthermore, a BBQ, a trip to the Kelpies, Falkirk Wheel and Stirling and a talks series about PhD experiences. We met a lot of people and had fun organising these activities, but the representatives need to be renewed every year, and are therefore looking for motivated students to take over for us.